I absolutely love Rice Krispie treats… I have ever since I was a kid, and I’ve never outgrown it. At some point in the 90’s, they even came out with a Rice Krispies Treats cereal! Do you remember this?! We were never allowed to eat junk cereal when I was growing up, but I distinctly remember a family vacation to the beach around the time I was 13, and when we went grocery shopping to stock the rental kitchen, my sister and I were allowed to pick out “fun” cereal. You better believe I ate that Rice Krispies Treats cereal every single day of vacation. 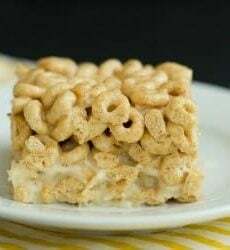 I adore the traditional treats made with Rice Krispies cereal, but I’ve also played around with the same concept using other cereals like Cheerios and Golden Grahams, and I put a muddy buddy spin on a version using Rice Chex. I’ve been wanting to make a version with Lucky Charms, and thought that it would be a perfectly festive way to celebrate St. Patrick’s Day! 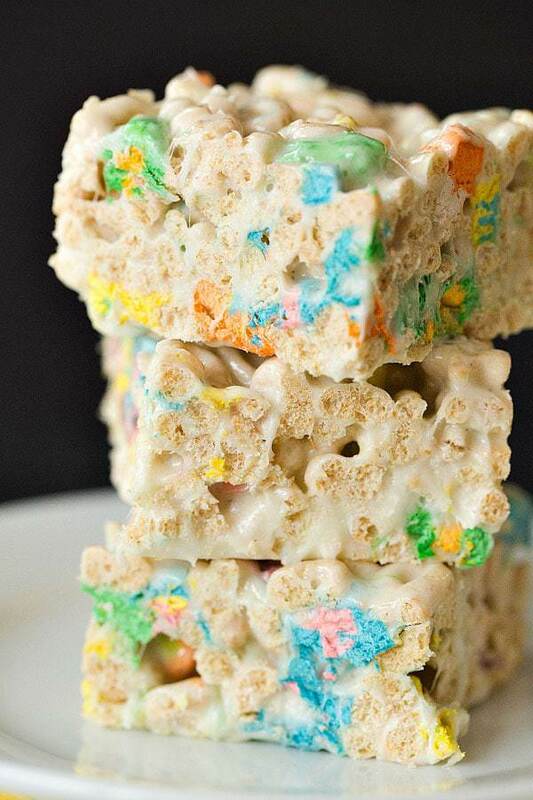 Watch How to Make Lucky Charms Marshmallow Treats! I used my preferred marshmallow-to-cereal ratio for these treats, simply substituting Lucky Charms for Rice Krispies. If you’re a huge fan of the colored marshmallows in Lucky Charms (admit it – they’re the best part! I totally pick them out of the cereal! ), you can actually buy JUST THE MARSHMALLOWS from Nuts.com. Can you say genius?! So feel free to add in more marshmallows if you’d like! What was your favorite guilty-pleasure cereal as a kid?! 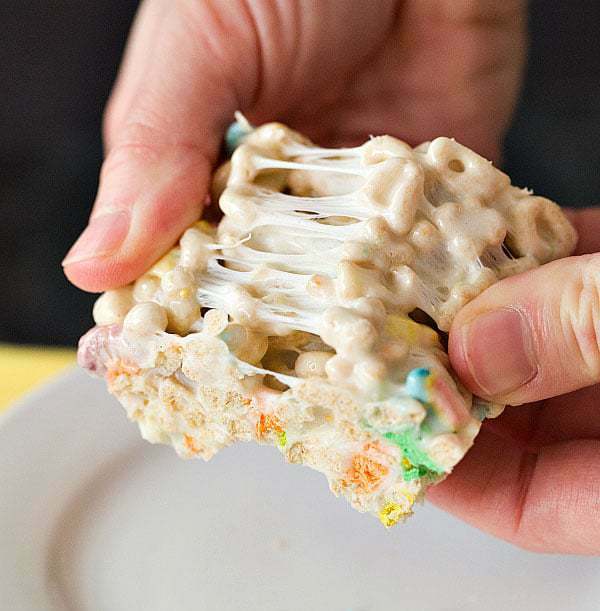 Huge, bakery-style marshmallow cereal treats made with Lucky Charms. Perfect for St. Patrick's Day! Grease a 9x13-inch pan; set aside. Melt the butter in a large pot over medium-low heat. Add the marshmallows and stir until completely melted. Reduce the heat to low and stir in the Lucky Charms cereal. 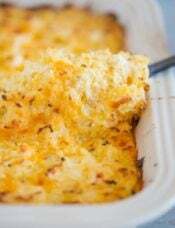 Turn the mixture into the prepared pan and press into an even layer. 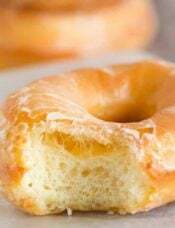 Allow to set at room temperature until firm, 30 minutes to 1 hour. Cut into squares and serve. 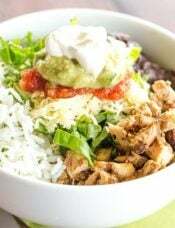 Store leftovers at room temperature in an airtight container for up to 4 days. 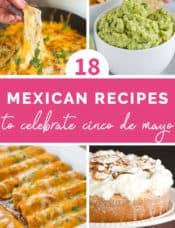 I followed this recipe this morning for an office party and can’t wait to try them. I did two extra things though, I bought a bigger box of cereal so I could use extra marshmallows to decorate when I finished and I used green food coloring. Also if anyone needs to know 8 cups of mini marshmallows is about 12 oz. Just put these in a pan, now I have to wait the time so I can cut them. I’ve been dreaming about them ever since I saw your video recently. I’m sure they will be delish as I kept a few morsels on the spoon for my enjoyment! How many more days til we get to meet your baby girl? Thanks for the review, Betsy! And about 1 more month before baby girl makes her arrival! I usually fill mine with soapy water and let it soak for awhile (at least an hour), and everything comes right off very easily. I think I mixed mine too much all the colors or the marshmallows combined and made an ugly color but still taste good. 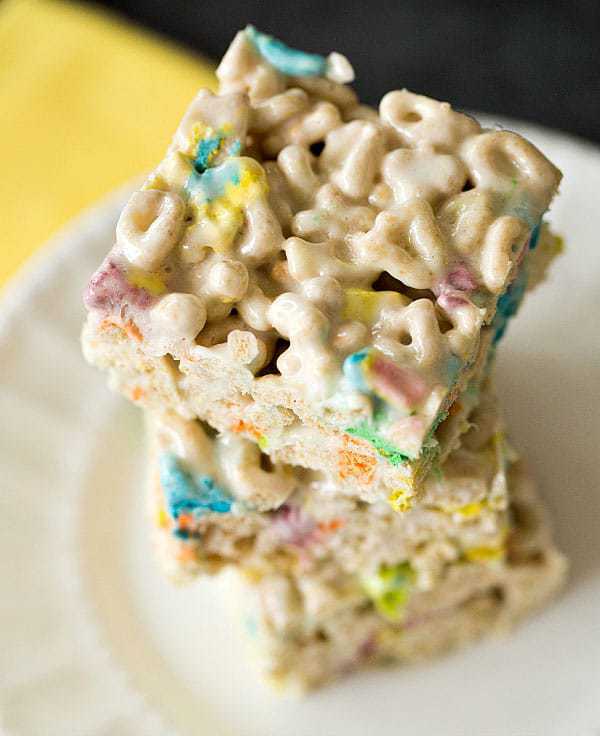 I love Rice Krispies Treats and Lucky Charms so this is a dangerous recipe for me. I’d have to resist eating the whole pan! 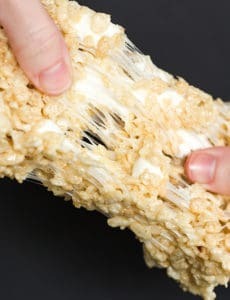 I used to love the rice krispy treat cereal! My mom wouldn’t let me get it very often but so good! These look really fun. Oh my- these look amazing! I’m a big fan of lucky charms- I’ll have to give these a try! Basically, same recipe – but put in cupcake liners and make rice krispie cake cupcakes!!!! My brother and I also chose RKT cereal as our guilty pleasure! Otherwise, it was Kix or Honey Nut Cheerios. Lucky Charms were an indulgence we only snuck in at our cousins’ house because Auntie Betty allowed what mom didn’t! these look fabulous! I adore rice krispie treats and lucky charms are one of my favorite cereals!! They still make the cereal!!! And it’s in select stores! It was one of my favorites too, along with Lucky Charms and Cinnamon Toast crunch of course :) These are so cute, I made them last year and they were a hit at work! My favorite cereal as a kid was captain crunch. So good. I love the colors in these rice crispie treats. I must say that when I saw the picture I visioned Joseph as a toddler eating these treats and enjoying the colors in them. :). Cap’n Crunch with Crunchberries is a fav of mine, with Frosted Flakes close behind. Yum! I bet browned butter would make this even better mmm! I just made the same thing the other day! Except yours are better because they are bigger. I definitely could have used more cereal in mine since there is less surface area than with puffed rice cereal. I always add a little milk(1 tbsp) and vanilla(1 tsp) to the melted marshmallows. Makes them incredibly smooth :) YUMMY! you must try using browned butter, it takes them to another level. 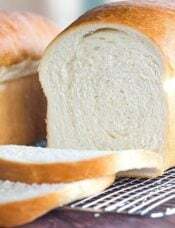 i used the recipe from the ‘flour’ cookbook. it calls for browned butter and a vanilla bean. i have also made the martha stewart recipe with froot loops,etc sally mentions above. i think they’re called confetti squares. 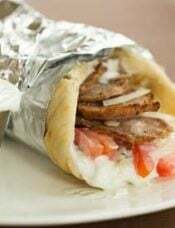 they are always a big hit at cookouts.